Need an easy breakfast treat? Here is an easy fresh mango bread recipe that is slightly sweet, very moist and flavored with the addition of fresh mango. Tuesdays with Dorie, Dorie Greenspan, took us tropical this week. Kelly of Baking with the Boys picked out Fresh Mango Bread. I loved the recipe as it was very easy to make. It has a base of canola oil and eggs, which I contribute with the addition of white and brown sugar, for making the crust slightly crisp but leaving the instead moist. I was concerned that the mangos would leave the bread too wet, but it left it moist, sweet and very flavorful! The chunks of fresh mango are a wonderful surprise in every bite. As always Dorie did not disappoint us. Be sure to check out rest of the TWD’s Fresh Mango Bread and head over to Kelly’s site for the recipe! 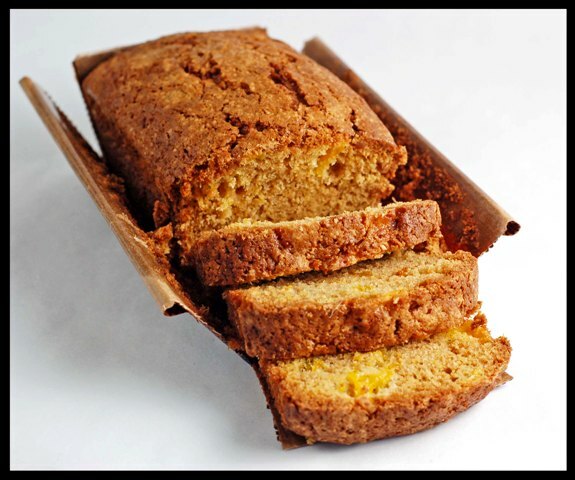 3 Responses to "Fresh Mango Bread"
Ooooh, I've never thought of adding mango to a quick bread! What a genius idea, of course. Sounds like a great summer time snack! Your mango bread looks really moist and delish! That is the most interesting loaf pan I've seen - cool! This is lovely! It looks perfect. Dorie continues to amaze me with such yummy recipes!